This vaporizer comes equipped with both single and dual titanium coil atomizers that utilize a glass quartz heating rod for it's potent flavor producing qualities. 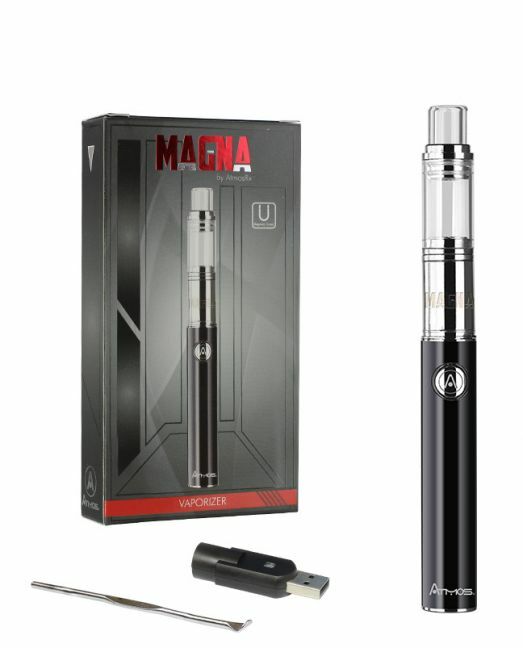 A transparent glass mouthpiece gives you the opportunity to watch your vapor fill and diffuse while a magnetic chamber cover makes allows you to fill the Magna vaporizer at any moments notice. This vaporizer is powered by a 650mAh lithium-ion battery with a simple to use one button operation that can toggle through three different temperature levels in order to customize your vape experience as each temperature level will provide different results for different types of material. AtmosRX includes everything you need to begin vaping concentrates right out of the box and even includes a pocket-friendly travel case s you can be ready to vape at the touch of a button no matter where you go.